One of the key components of successful trading or investing, is the ability to trade around a CORE position. The “core” position as we say, is the main position of the investment or the primary amount of shares or contracts that you wish to have on during the majority of the time you are in a particular trade. Sadly, most people have no understanding of how to apply such a concept, and they plow into a trade or investment in just one single entry. Giving yourself one entry or at best 2, has very limiting implications, but what is even more limiting is the idea of holding just 1 or 2 lots for the entire move. It is true that a majority of market players approach the market in this fashion. They enter once or twice at best and they move into the next phase of the their trading plan which typically is to either STOP OUT on their trade or move to take profits and exit the trade. This is a very amateur and novice approach to the markets. It is possible to achieve winning results with the above mentioned style of market play, however one must adhere to strict risk reward profiles and the opportunity for significant gains outside the normal risk reward profiles is very limited. 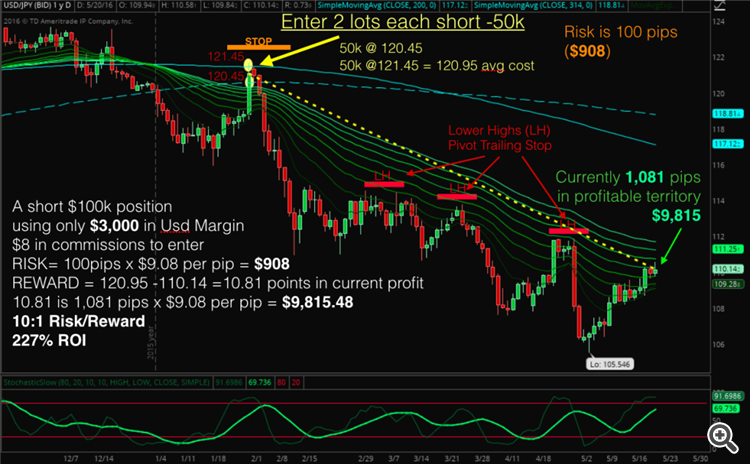 The ideal scenario and the exceptional gains come from adding to your play. 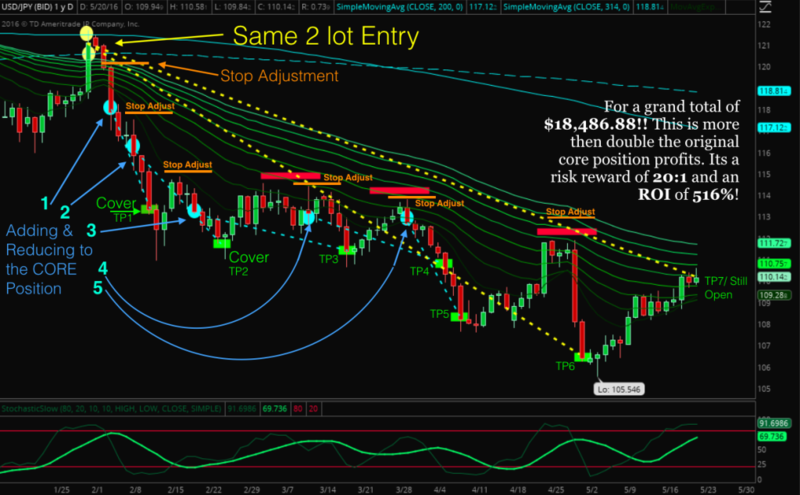 This is the concept of trading “around” your initial entries or your CORE position. Let me show and explain in the below scenarios the difference between taking a core position followed by simply exiting, and the difference of ADDING & REDUCING around the core position. Let’s take an example in our model of a trade on the Dollar vs the Yen (USD/JPY). Back in January of this year, the USD/JPY rallied into the 200 period and 314 period moving averages and then subsequently failed resuming its downtrend. If you had shorted into the rally inititiatiing positions at both of these locations, a short position at 120.45 and an additional short position at 121.45 would have been initiated. If in this example, you shorted a 50,000 lot at each price, your average cost would then be 120.95 for a total position size of short 100,000. A simple stop about 100 pips above the market would then be appropriate giving the trade some room above these 2 main moving averages. Since the failure and rejection in Jan/Feb, the price on USD/JPY has remained in a well defined downtrend, and lets assume in this example that you or the individual is still short as the longterm trend has not been violated and USD/JPY has continued to make Lower Lows and Lower Highs. The current price as of the last daily closing on Friday May 20th, 2016 is 110.14 – shown on the below chart. At the current level of 110.14 on USDJPY, for every 50,000 lot position, USDJPY will move $4.54 per pip. Now if your average cost of the 2 lot entry is 120.95 on a 100,000 size position, and your stop is 100 pips above the market, your risk is 100 pips x $9.08 per pip = $908. Also to enter into a 100k short position, most brokers will give you 30:1 or 50:1 in the USA, outside the US some firms allow up to 200:1, however for our purposes to put on 100k position it costs $3,000 in used margin. Now since the start of the current downtrend and after our initial entries, USD/JPY has made a series of Lower Highs (LH on the below chart) and our model would still be in this play until a break of the pivot Lower High currently around 112. See the below chart for the visual of what the above paragraph just went over. 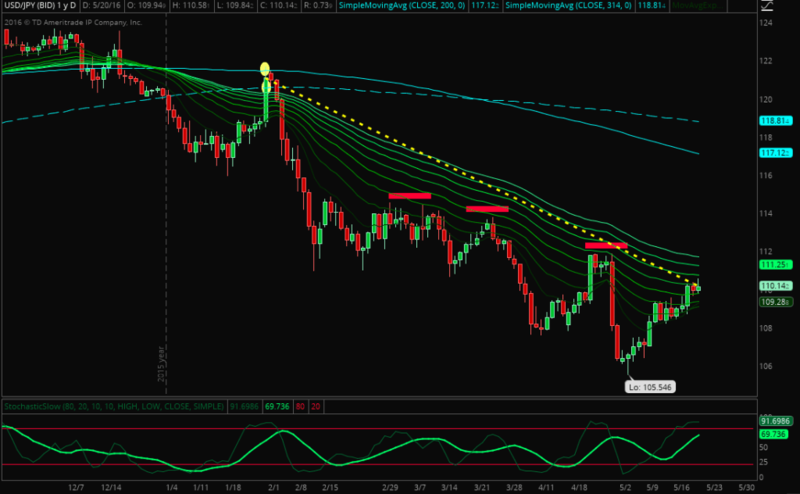 The above is an example of a very nice trade and the model caught a nice long-term downtrend. 10:1 Risk Reward and 227% ROI crushes most returns out there in any other markets. Now lets do one better however, and let’s look at the types of returns one can achieve by applying an Adding & Reducing method as you trade around the CORE position…. Here we have the same 2 lot CORE entries, but we add to the short by selling another 50k short on the break of the Green Real Money Bar, and this type of reversal also creates what we call a Delayed Bear 180 (These setups we go over in our training rooms and coaching seminars . However, after the add we bring our stop down now to the first Stop Adjustment highlighted in orange on the below chart. Next we get another event we call a Green Bar Ignored or GBI this is actually a neutral bar ignored in this scenario but it serves the same purpose – we add another 50k short. Next we take some profit and this is marked by the green “Cover TP1” on the chart. TP1 stands for Take Profit 1, with 1 being the 1st profit taking event in the series. 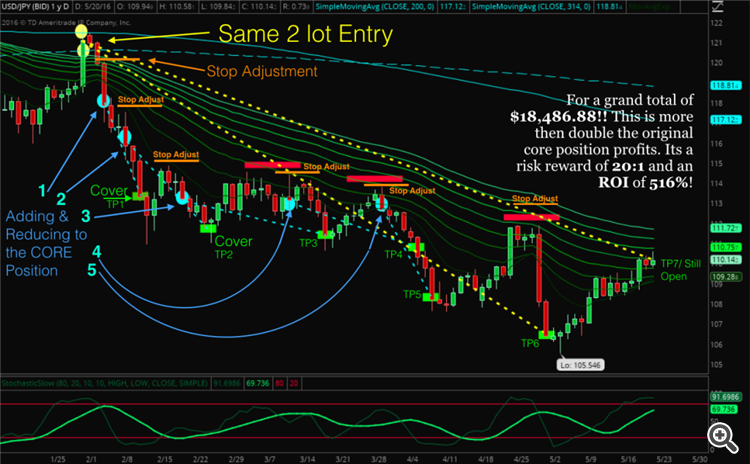 We then move our stop down to above our second add locations high which creates a pivot. 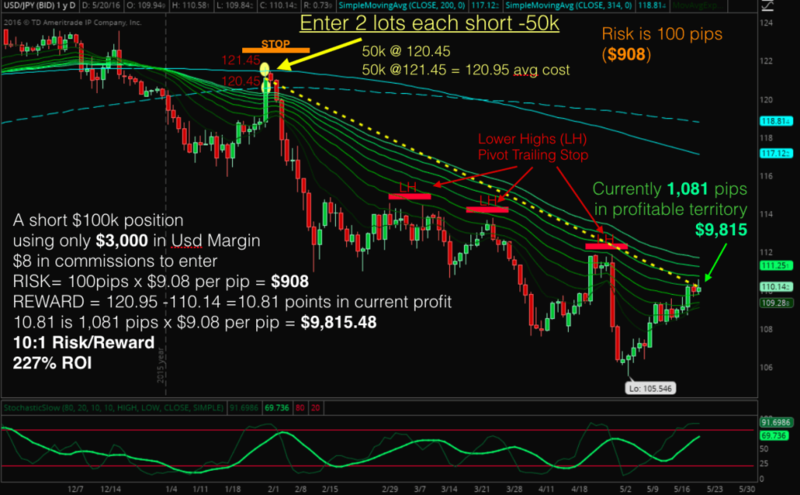 Next we get another Sell Setup, this is another technique we teach. From here the next move is a cover into TP2 and we then again bring our stop down to the pivot lower highs. From here you can see on the chart this pattern of Adding & Reducing continues with each Sell Setup in our model and each cover location in the model as well. The last take profit event comes at TP6 where we had 2 exhaustion bars into new lower lows – which our model always takes on new lower lows, and this brought us out of 1 of our initial CORE pieces. The last lot at TP7 could be closed for calculation of profits which we will do in the below paragraph, but this last lot could also remain open with at trading stop applied to the Lower Highs designated on the chart. Below is the chart of the power of compounding a core trade by adding and reducing to the play. For a grand total of $18,486.88!! This is more then double the original core position profits. Its a risk reward of 20:1 and an ROI of 516%! This is the power of Adding & Reducing Risk and trading around a winning CORE position.